RenderMan Pro Server 16 introduces first class support for deep compositing applications through an extension of the deep file format, and added support for direct rendering of deep compositing images. Deep compositing allows for the accurate compositing of disparate rendered elements with multiple objects whose depths may intersect in ways which prohibit the use of standard 2D compositing techniques. In previous releases, deep output from the renderer was constrained to special display modes (i.e. "deepopacity"). This is now no longer the case. A primary mode such as RI_RGBA, RI_RGBAI, or any arbitrary output variable (AOV) can now be sent to the deepshad display driver. 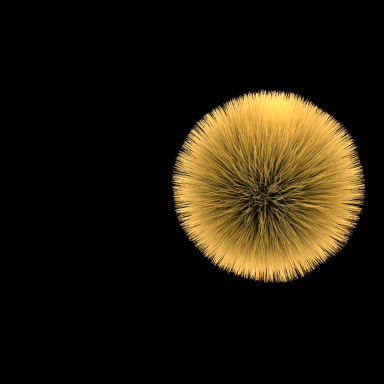 These AOVs will be rendered as deep compositing output. The use of the "subimage" parameter is encouraged as a way of uniquely identifying the subimage. In conjunction with a naming convention, this will allow applications to be able to recognize the type of data stored in the deep compositing image and react accordingly. We will cover this point in greater detail later. DisplayChannel "float diffusea" "string opacity" "diffuseopacity"
DisplayChannel "float diffusea" "string interpretation" "alpha"
Along with the full generality of AOVs and the ability to combine subimages into one file, we can also take advantage of multiple camera rendering. The following RIB demonstrates how to render a left eye image and a right eye image simultaneously, with the assumption that the left eye is rendering using the world camera and the right eye is rendering using a Camera named "right". The resulting single file will have two subimages, one for each eye. Display "scene.dtex" "deepshad" "Ci,a" "string subimage" "lefteye.rgba"
Display "+scene.dtex" "deepshad" "Ci,a" "string subimage" "righteye.rgba"
In a more complicated setup where the right eye and left eye cannot share Ci (due to view-dependent shading), we may have shaders that are computing a separate rightCi and rightOi AOV. The following RIB demonstrates how to output a single image for that situation. DisplayChannel "float righta" "string opacity" "rightOi"
"string subimage" "righteye.rgba" "string camera" "right"
Now the complexity of the deep representation is more obvious in this view. The pixel window displays a graph of the depth and color of all samples down the pixel shaft. The yellow line graphs the alpha channel, while the red, green, and blue lines graph the red, green, and blue color channels. The colored bar above the graphs is colored using the color of each sample. 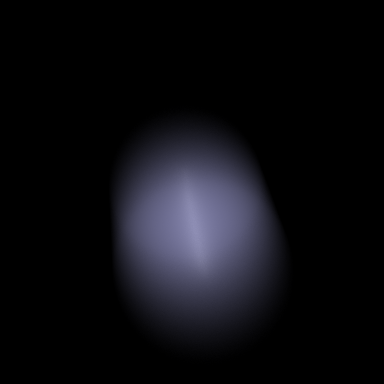 You can now see that the image is "deep", and contains two widely spaced samples from the blue sphere, along with several clustered samples from the fur patch. 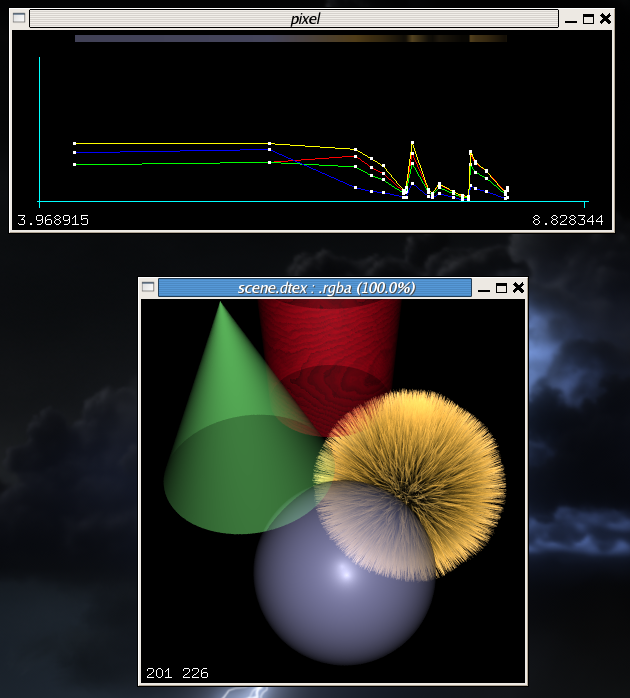 The main image window of both sho and dsview display only the fully composited results of each pixel. This will become more obvious later on. Color data from separate cameras cannot be placed in the same subimage. 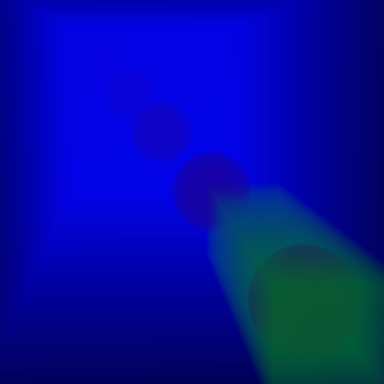 This is because the depth functions are very different, and they cannot share Z values. PRMan automatically enforces this anyways because cameras are bound to the Display line, not to the DisplayChannel line. The number of channels stored in a subimage always include a depth. If the depth can be shared between color channels because the information came from the same camera then repeatedly specifying the depth for each subimage may be redundant. A standard naming convention in order to establish a clear data interpretation is easier to establish with colors in separate subimages. Both lossy and lossless compression may be more efficient with colors stored in separate subimages. With regards to naming convention of subimages, the convention used by tools such as sho and dsview is to inspect a period-separated suffix. If the name of the subimage has a suffix that begins with "rgba", and the number of channels in the subimage is equal to or greater than 4, those utilities will interpret the subimage as a deep compositing image with the RGB channel data starting at 0 and the A channel in channel 4. (Note that this allows for RGBAI images to be named as ".rgbai" and still be viewable in sho.) We encourage users to adopt this convention through use of the "subimage" parameter to the "Display" line, but we also realize that this may not be suitable for all pipelines or workflows. By their nature, deep compositing images can be very large. The size of these images is determined chiefly by depth complexity, but is also determined by PixelSamples. This latter point may prove surprising, since there is no analogy in the 2D case. When generating a deep compositing image, subpixel functions are filtered into a single pixel function. This incurs a certain amount of loss of information, analogous to the spatial information lost when a subpixel 2D image is filtered into a pixel 2D image. However, a lot of interesting data in the depth dimension still remains, and is initially retained in the pixel function. PRMan adopts several compression strategies to deal with these very large images. A lossless compression is applied to the file; this is mostly transparent to the user (and to manipulators of deep images using PRMan's APIs). More importantly, it also uses a lossy compression scheme. The lossy compression scheme determines the accuracy in depth of the pixel function, and is controlled by Option "limits" "float deepshadowerror". Setting the compression scheme to a high value will result in lower numbers of samples stored in each pixel function; this can be verified by using the dsview or txinfo utilities. It is important to realize exactly when this lossy compression matters. Setting deepshadowerror to a very large value has zero to very little visual effect on a deep compositing image if that image is simply rendered and viewed. However, if that image is used as part of a deep compositing process and combined with other images, unacceptable errors may result in the composite. If we think about the process of depth compositing, it should be clear why: the accuracy depends on having a sufficient sampling down the depth of each pixel such that the depth order of geometry can be correctly constructed. If the deepshadowerror has been such that all such samples have been lossily compressed to only a few samples, the depth order cannot be correct and the composite is wrong. The default value of 0.01 is very conservative and results in fairly large files, but should result in files that can be correctly depth composited with subpixel accuracy. This subpixel accuracy can be traded off against the size of the files on disk by setting the compression threshold higher. Deep compositing images are well suited for compositing scenes with transparent objects that have complicated depth interactions. Consider the random assortment of geometry in the previous section. 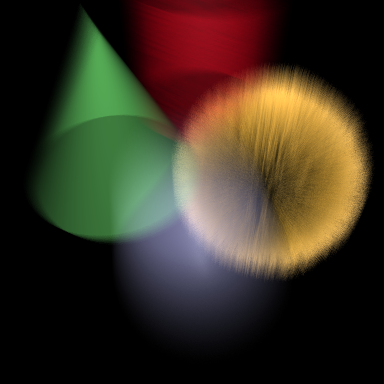 If we were to render each element (the green cone, the red cylinder, the blue sphere, and the yellowish clump of fur) as separate 2D images, it is not easy to composite these back together into a single image with the correct result. But it is trivial to do so when rendered as deep compositing images. As an example, we have provided a RIB file in the examples/deeptexture subdirectory of your PRMan distribution with the four elements going to four separate deep compositing images. If you render and view these, you should see the following images. The deep composite of these four images is accomplished simply by taking the four images and combining them with dtexmerge in any order, into a new merged deep composite output. 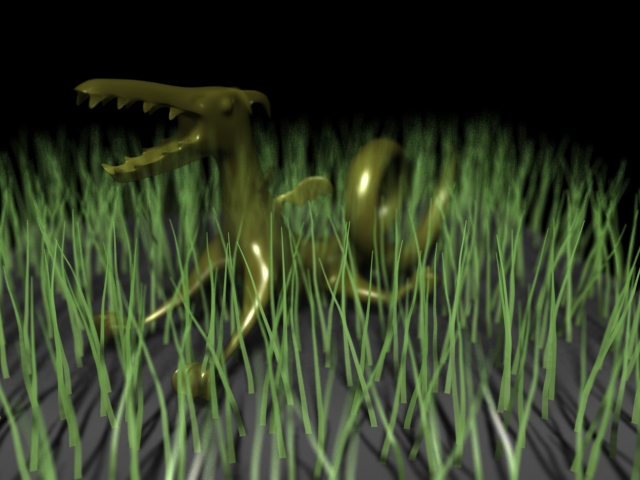 And then composited using dtexmerge to create a new merged deep compositing image with motion blur correctly resolved. Notice that the blue sphere is colliding with the green cone; this would be a situation particularly difficult to composite correctly using 2D techniques. In releases prior to PRMan 16.0, users have been able to use libdtex to manipulate deep shadow images. Starting with PRMan 16.0, a new and improved C++ binding has been provided; the following discussion will make use of this version of the API. In general terms, deep images simply store many samples for each pixel in the image. These samples are sorted in increasing depth order, but the deep texture format itself places no other constraints on the data. However, there may be constraints on the data depending on the deep image's intended purpose. For example, programmers manipulating deep shadow images produced by PRMan's deepopacity mode will find that the pixel representation is a monotonically decreasing function starting at 1.0 which stores the accumulated transparency as a function of depth. 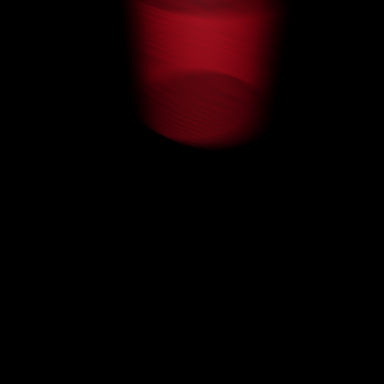 This is an optimal representation when these files are used for shadowing purposes. Similarly, deep compositing images are optimized for compositing purposes. Therefore, the constraint on the data is that the samples stored at each depth are intended to be premultiplied color and alpha values, such that when the standard over operator is used in increasing depth order, a fully composited image will result. The pixel must, of course, actually contain RGBA data; the Composite method expects two arguments which indicate the channel offsets to the RGB and A data. It will then composite the results into a buffer containing at least four floats. The result is a fully composited 2D pixel. This is the routine used by sho and dsview to deliver results to the framebuffer. Deep compositing is also very straightforward. Given the pixel representation as described above, the act of combining two deep compositing images to produce a new composite image requires only that each pixel function be merged: all samples that were in both images should be kept in the new image, but sorted in depth order. We provide the full source code for dtexmerge as part of the librix distribution in the file RixDeepTextureMerge.cpp. This file can be used as a starting point for writing your own utilities to manipulate deep images. For now, we will focus on the inner pixel loop of RixDeepTextureMerge.cpp. After loading a pixel from the first image, all pixels from subsequent images are merged in place, creating an ever-increasing chain of deep compositing samples. After all input images are read, we simply deposit them into the output image. 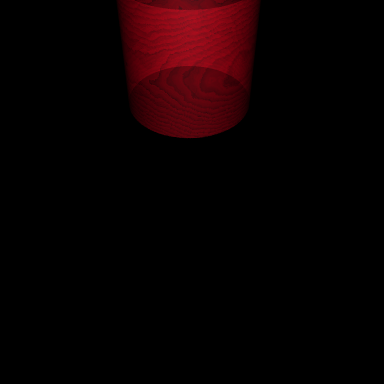 The output image can then be manipulated with DtexCompositePixel to produce a 2D composited result if desired. There are two points of note. First, these identifiers should not be composited, nor should they be compressed. Therefore, PRMan will take special care to avoid compressing samples with disparate Attribute "identifier" "id", but only when "id" is specifically requested as an output on the deep compositing image. Second, these identifiers are of type int, whereas the native data type of a deep pixel is float. To avoid loss of unique ids, the raw bit representation of the int is stored in the float. This requires special care when casting to avoid getting the wrong id. Once these identifiers are present in the deep compositing image, a host of interesting operations are now available. For example, suppose that we have a complicated render where we desired to perform a color grading operation only on a specific object in the scene. If a deep compositing image is generated containing "id" information, we can write a program that performs that color grading operation by looping over the deep compositing pixel data. As a concrete example, consider the file "scene_moving.rib" provided in the examples/deeptexture subdirectory of your PRMan distribution. It contains Display lines identical to those shown above. The rendered output should be similar: it is the same picture in the previous section, except that all elements were generated in one pass. // number of channels is 5. Even if we are not interested in performing the composite using deep images, they can still be used as a way of augmenting a traditional 2D compositing pipeline. Suppose we are rendering a semi-transparent object nestled amongst some complicated geometry. The drawback of this approach is that the matte geometry ends up being rendered twice. It is often the case that in the matte pass, trivial shaders can be substituted, but shading is not the only cost of the render - for example, a procedural generation system may have to execute twice just to emit the geometry in RIB form. We can avoid this extra rendering cost by using a deep compositing arbitrary output from the first layer as a matte file for the second layer. 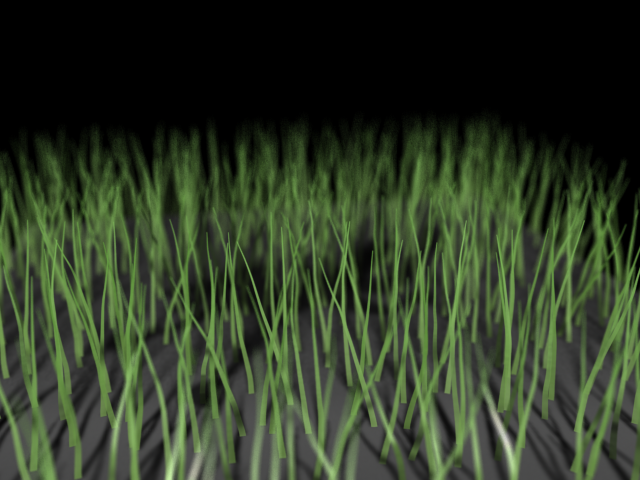 First, we can render the grass as usual, but also create an auxiliary grass.dtex file - this second file is the matte file. 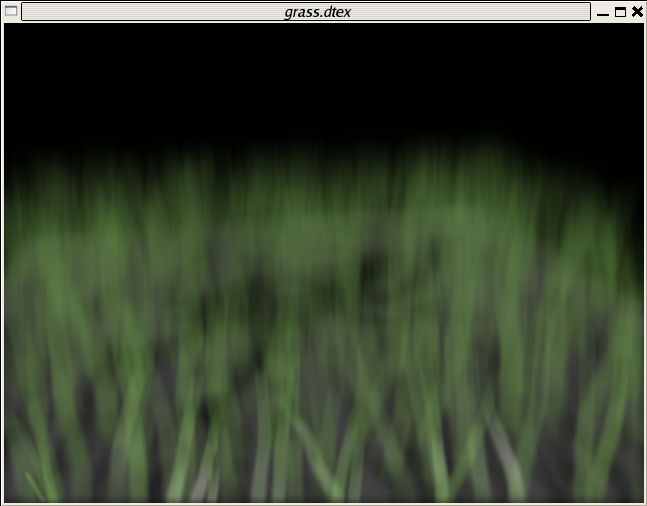 Display "+grass.dtex" "deepshad" "Ci,a" "string subimage" "grass.rgba"
With this approach, we have now avoided the cost of rendering any geometry twice. There are some caveats with this approach. 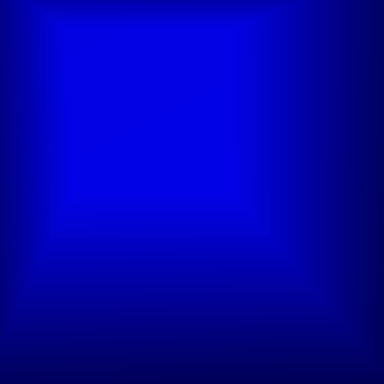 Deep texture maps are limited to pixel resolution, not subpixel resolution. Hence, the accuracy of the element rendered using the matte file will not be subpixel accurate. (Keep in mind that one loses subpixel accuracy in the final 2D composite anyways.) 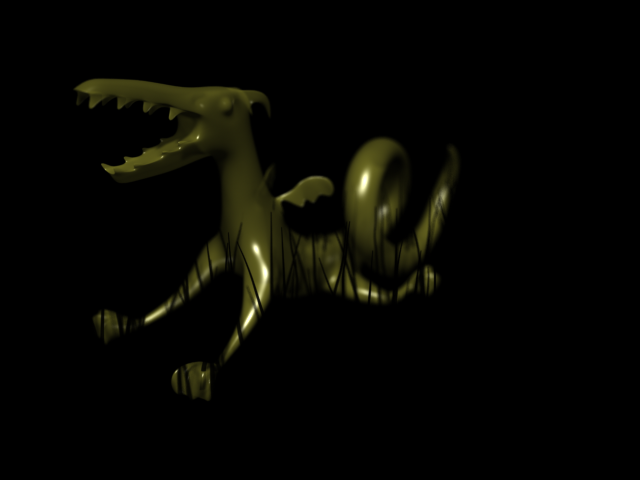 Also, it is worth noting once more that deep texture maps have a lossy compression applied down Z. The extent of this compression is a disk space vs accuracy tradeoff: smaller files will mean a less accurate matte. As previously mentioned, deep images store many samples for each pixel in the image. Depending on the opacity cull settings, these samples not only represent data from the nearest object to the camera but also contain information on objects that may normally be occluded by the nearest opaque object. With this extra information, and the depth information stored in each sample, we can perform extra operations such as performing a defocus on a deep composite image outside of the normal render pipeline. 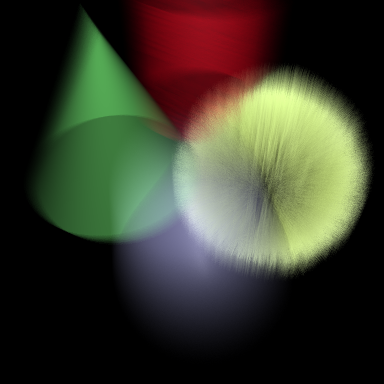 We provide example source code for an OpenGL based interactive defocus application as part of the librix distribution in the file RixDeepTextureDefocus.cpp. This example was written to target the OpenGL 2.0 API with the framebuffer object extension and relies on the glut and glew libraries. 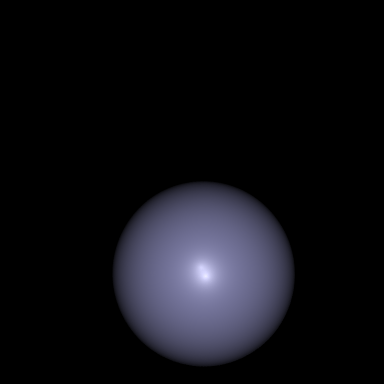 It draws points for every sample read out of a deep compositing file, with radius computed by a vertex shader; this shader computes the radius using the distance of the sample away from the camera and the depth of field settings. An offscreen framebuffer is used to guarantee 32 bit per channel color, which is needed for accuracy. The depth of field settings can be changed interactively: the f-stop is controlled by the +/- keys, the focal length is altered by dragging the left mouse button, and the focal distance is altered by dragging the right mouse button. An example of the image drawn by this program is shown below. The blending mode used assumes that the hardware supports destination alpha. It assumes that every point in the file fits in host RAM (since it performs a sort of all points by depth), and also assumes that every point in the file also fits in GPU RAM. The first could be solved by operating only on smaller regions of the entire image at a time. 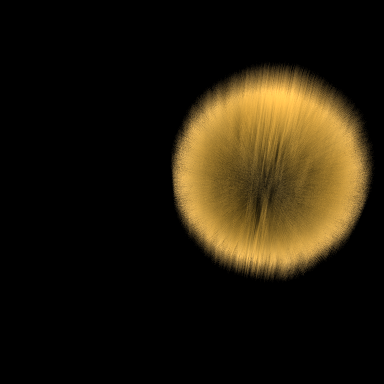 The second is solveable by avoiding the use of a vertex buffer object (however, this may affect performance). 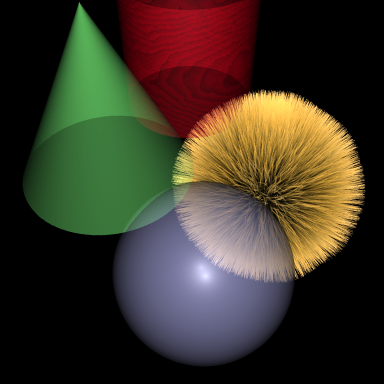 An assumption is made that the image was rendered with ScreenWindow -1 1 -1 1; this affects the computation of the point radius in the vertex shader. 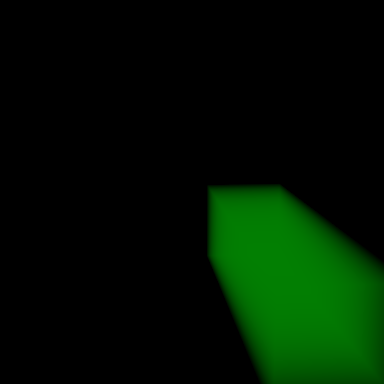 OpenGL imposes several limitations related to the antialiasing of small points, which proves especially problematic for points that are near a radius of 1. The example code avoids point antialiasing altogether, which usually means the "disks" that are drawn are actually small squares. This can lead to some obvious image artifacts when the circle of confusion is very small (particularly when transitioning from a "disk" which is actually one square pixel to a "disk" which is 2x2, four square pixels). 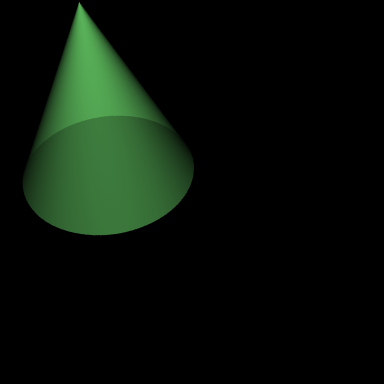 Depending on the OpenGL implementation, these problems may be alleviated by drawing a more complicated shape with triangles (e.g. 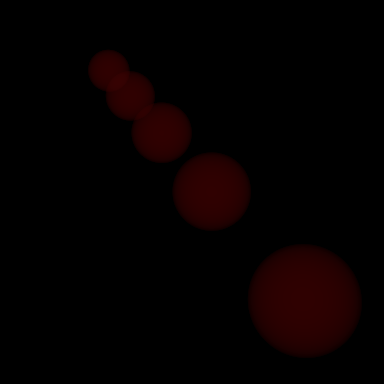 a hexagon for every point; this is easily accomplished using a geometry shader if the OpenGL implementation supports it), or by supersampling (by increasing the size of the framebuffer object and downsampling the result) and drawing antialiased points. Samples originating from volumes can now be flagged in deep compositing image output. We have chosen to indicate this with a negative sign on the values in the alpha channel. When this occurs, it indicates that the region down the pixel shaft from that sample until the next sample is within a volume and that that particular sample came from the volume. If the volume would end before the next sample, we insert a fully transparent (zeros in all channels but Z) sample in order to mark the end of the volume region. There are no overlapping volume regions within a pixel; any embedded geometry or overlapping volumes will cause the regions to be subdivided and resolved into disjoint spans before output. to the rendermn.ini file will disable the flagging of volumes and revert to generating deep images that are fully backwards compatible with PRMan 16 output. This merges the contents of the src pixel into the dest pixel, much like the existing DtexMergePixel() function. However, it is aware of our convention for flagging volume samples and will subdivide volume regions as necessary for embedded geometry, as well as resolve overlapping volume regions to produce volume samples with the combined light contribution and extinction coefficient properties from both volumes. This combination takes into account the potential interactions between the volumes wherein light contributed by one volume may be attenuated by the other. In order to do this, the function needs to know which are the color and alpha channels. We follow the convention of DtexCompositePixel() in specifying these and the assumption of three contiguous color channels plus a single alpha channel. Any extra channels will be passed through unchanged or copied from the most recent volume sample in either pixel. With regard to tools, both the dsview and 'it' utilities properly display the new deep images. Furthermore, dsview has been updated so that the graph of the pixel function displays the absolute value of the data from each channel, but indicates the presence of a negative sign by a hollow point instead of a solid point. An example of taking three images with volumes and merging them is shown below. The lower right image is the result of applying dtexmerge to the other three. Notice that the samples from the blue volume are correctly being split and smoothly attenuating the spheres as they receed into the distance. In PRMan 16.0 deep compositing pixel functions only store accurate samples up until the first opaque object. This limits the ability to perform operations such as removing opaque objects by their identifier, or perform defocus on deep compositing images. We plan to address this limitation in a future release.